The Shank and Neck are recommended for stewed dishes. 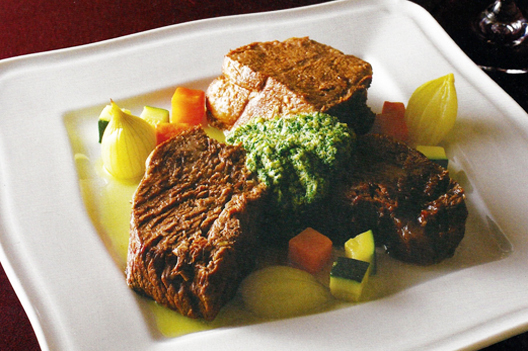 Because of the delicious taste of Wagyu, first taste the beef with no flavorings. Then, enjoy variations on the taste with sauces. Step 1 Make the green sauce. Combine and finely mince Italian parsley and garlic. Combine anchovies and parsley until they are of a mined consistency. Mix all ingredients. Step 2 Tie the whole cut of beef to hold it together. Put beef in a pot with enough water to cover with the carrot, onion, thinly sliced celery, bay leaf, pepper and aalt. Skim the scum while simmering on low heat for 2-4 hours.